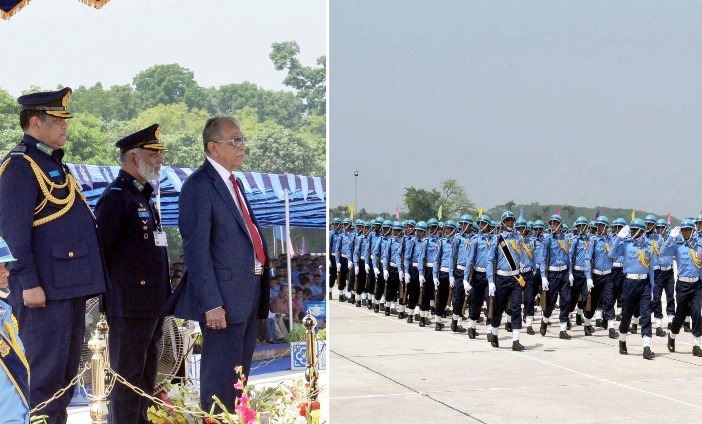 President Abdul Hamid on Wednesday urged the newly commissioned officers of Bangladesh Air Force (BAF) to remain active to improve their professional skills through practice and utilising the lessons they received from training, reports UNB. Hamid was addressing the Winter President Parade of Flight Cadet Course (FCC) of Bangladesh Air Force (BAF) at BAF Academy at Jashore. "You've to remain active to improve your professional skills through practice and application of the basic training you have received from the academy. You should keep in mind that you'll have to build yourself as deserving successors for the future leadership of the Air Force working with honesty, dedication and devotion," the President said. There is no alternative to training to achieve skills, he said adding, "Modern facilities are made available for increasing the overall efficiency of the members of the Air Force." The President also asked the BAF personnel to always remain alert to play the role in any necessity of the country apart from protecting the country's independence and sovereignty. He said a process is on to set up 'Bangabandhu Sheikh Mujibur Rahman Aviation and Aerospace University' and Aerospace Industry for the Air Force in Lalmonirhat for the advancement of the aviation sector. Mentioning the force as the symbol of pride, the President also hoped that the force will uphold their name and image with the coordinated efforts at home and abroad. Earlier, the President reviewed the smartly turned out parade and took the salute at the impressive March past as the chief guest. He also handed over trophies, certificates and flying badges among the flight cadets. On his arrival at the BAF Academy Parade Ground, the President was received by Air Chief Marshal Masihuzzaman Serniabat and commandant BAF Academy Air Commodore Muhammad Shafqat. With today's Winter President Parade, a total of 61 flight cadets, including 10 female ones, were commissioned.